Pumpkin cake roll, small batch style! A mini cake roll recipe made in a 8×8″ brownie pan makes a small cake roll that serves two. Recipe makes 8-9 small slices of cake. I made us a mini cake roll today! Just because we don’t bake large cakes here at Dessert for Two doesn’t mean we should be denied the pleasure of a good Fall cake roll. I use my brownie pan that measures 8×8″ to make small cake rolls. This pumpkin sponge cake is filled with pumpkin spice whipped cream. I have a lemon cake roll with matcha cream in my third cookbook, Sweet & Simple: Dessert for Two. I’ve been wanting to expand on it and make other flavors, and decided a pumpkin cake roll would be perfect. What is a cake roll? If you watched Great British Bake Off, you watched plenty of cake roll fails on the last season. In almost every case, it was because the baker didn’t beat the eggs long enough. Even if they did, the baker then added too many other wet ingredients that deflated the eggs. If you’re a Great British Bake Off fan, please tell me you know about the Masterclass with Paul and Mary! Have you seen the Masterclass episode that included Paul’s licorice cake roll? Maybe one day I’ll have the courage to dye half of the batter and give my cake roll stripes. At this point, though, I’m too afraid of deflating the batter! The reason a cake roll cake is soft and pliable is because it’s an egg-based sponge cake. 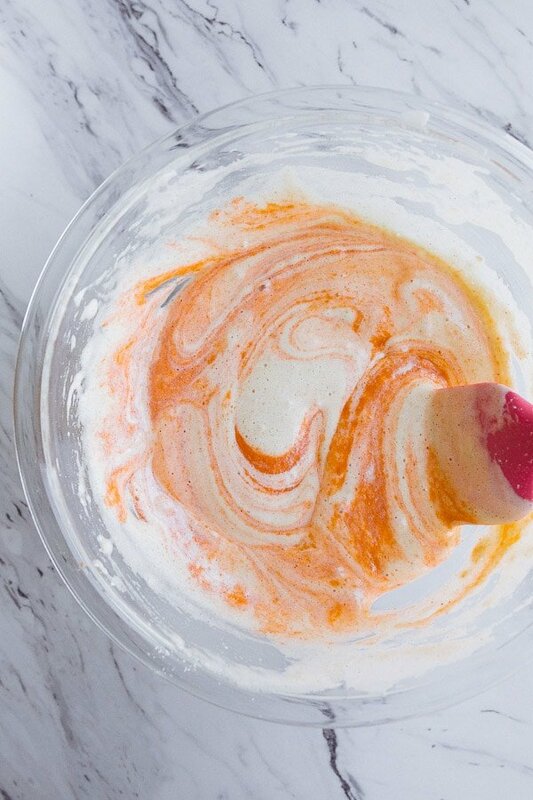 The first and most important part of this recipe is beating the eggs and sugar for so long that it turns into a pale yellow super light and foamy mixture. When you pick up the beaters, the batter falls back on itself and makes a pattern before sinking into the rest of the batter. It takes about 5-8 minutes of beating on high with a strong hand-held mixer to achieve this. If you skimp on this step and don’t properly inflate and fluff your eggs, the cake won’t rise as high in the oven. Ok, I’m acting like all you have to do is beat the heck out of some eggs and then you get a flexible cake. There’s one more important step: once you beat all of that air into the eggs, you have to be careful not to stir it out. We do this by GENTLY folding in the flour and other ingredients. The problem with gently folding in flour is that it takes about 5 minutes to do. That doesn’t sound like a long time, but call me after your next 5 minute arm workout. A cake roll is an arm workout, friends. But, then we have spare calories to eat the cake roll, right? Right! 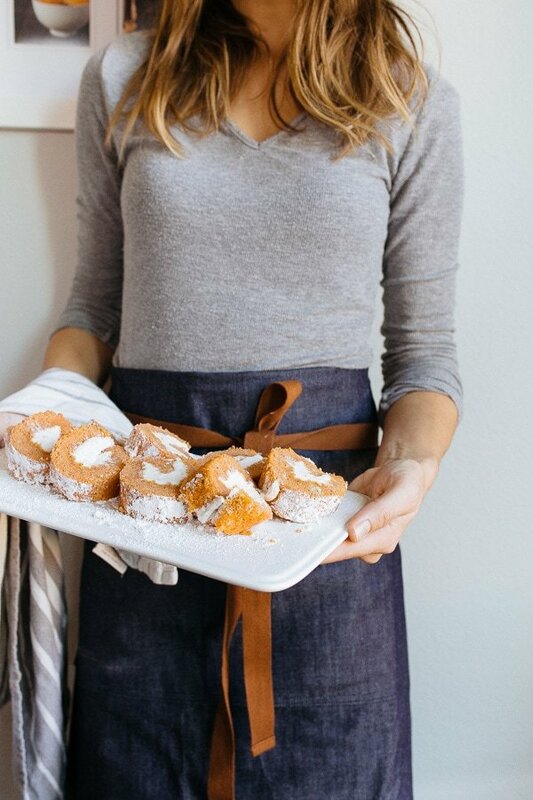 How do you bake a roll cake? 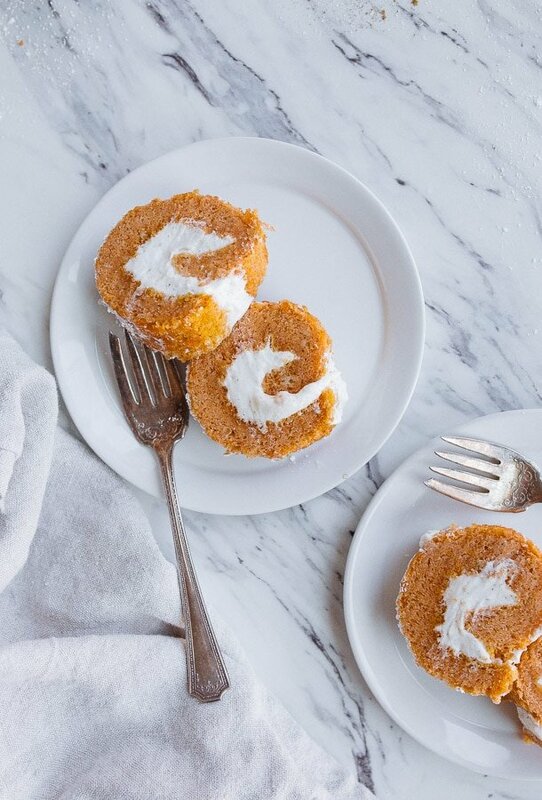 This pumpkin roll recipe is made in an 8×8″ square baking pan. I love making recipes for you in this pan because it’s such a common size–you probably already have it in your kitchen! It’s the pan you usually make brownies in, in case you didn’t know. 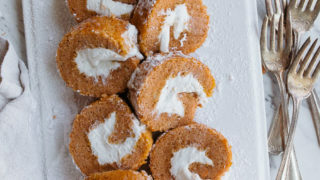 It makes me so happy when you don’t have to buy a special piece of bakeware in order to make a small pumpkin cake roll. A regular cake roll is made in a giant 15×10 pan. I adore that this pumpkin cake roll recipe is made in a tiny 8″ square pan with just one swirl on the inside. Even I can admit that a huge cake roll with multiple swirls is beautiful. But, for the small batch lifestyle, a small cake roll with one petite swirl is perfect. Another reason I love a cake roll is that it’s frosting and cake, all in one. I hand these out like sandwiches at a party or tail gating event. While it’s a little hard to keep track of exactly how much cake you’re eating when it’s in a handy small slice, those are the little things in life that you shouldn’t worry about so much. 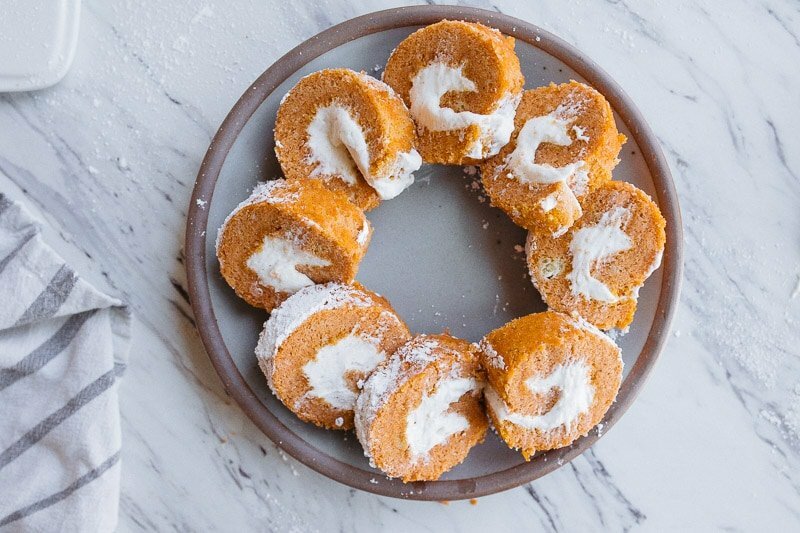 If you’ve ever made a cake roll and haven’t had success with it, like maybe it cracked the whole time you were rolling or wouldn’t stay rolled, I have a few tips. Roll the cake immediately after it comes out of the oven. In our case, we remove the pan from the oven, let it cool for 2 minutes, run a knife around the edge, and then dump the cake onto a clean dish towel. As soon as the cake hits the dish towel, roll the cake. 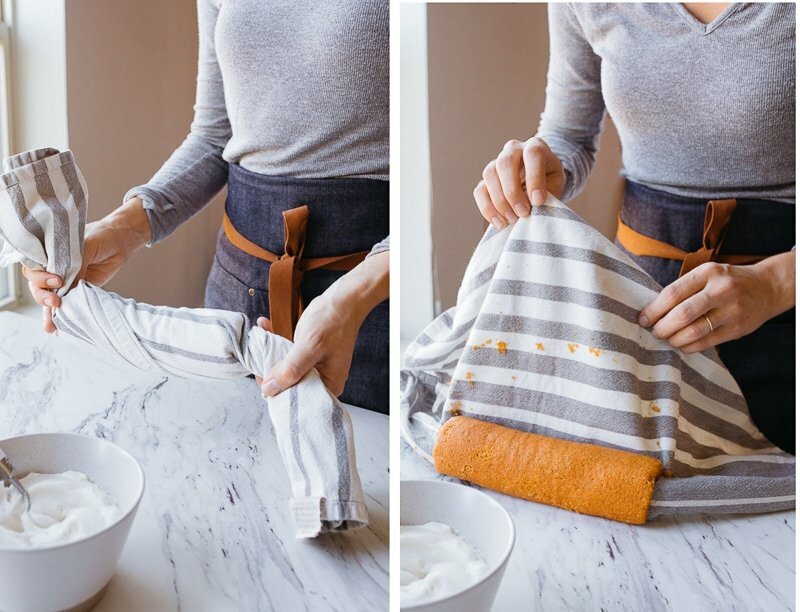 When rolling the cake, do it very quickly, slightly aggressive, and do not worry about the insides of the towel getting caught up in the roll. Roll the cake and towel together to become one, ok? When I made this cake roll for the first time, I forgot about this, and tried to roll the cake in a way that wouldn’t tangle the towel in the roll. Big mistake. The cake cracked like crazy! I don’t know why I forgot about this step, because the cake literally need the towel between the layers so it doesn’t stick to itself. Let the cake cool completely rolled up in the towel before attempting to fill it. Overnight is great, but at least 4-6 hours. Once the cake is completely cool, unroll it, spread the filling, and roll it back up. You can keep it like this for a few hours before serving. Always store it in the fridge, since we’re using a soft whipped cream filling. These four tips are the absolute only way I can guarantee you that your cake won’t break when rolling. If you follow all of these tips and it still breaks, it’s likely that you didn’t beat enough air into the eggs. Or, you deflated all the air you beat into the eggs by not folding in the flour carefully. Try again; even when a pumpkin cake roll cracks, it’s still edible. 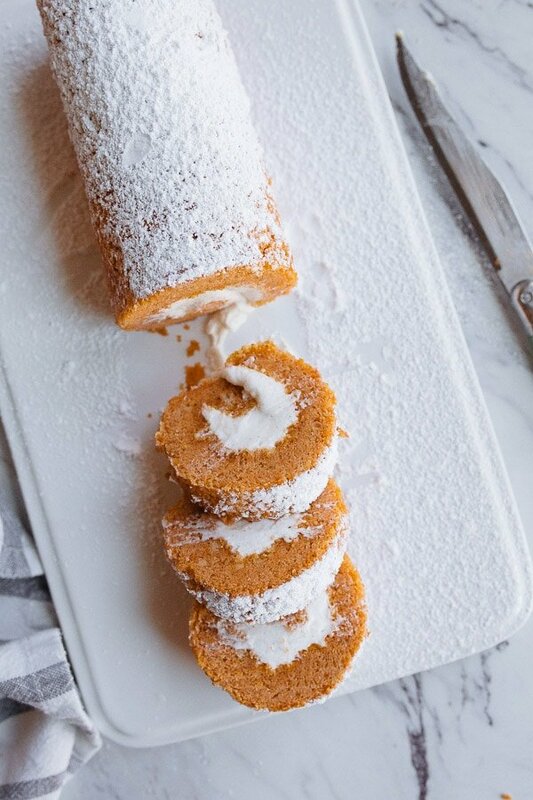 If you make this pumpkin cake roll recipe, I’d love to hear about it! Leave me a comment below, or send me a photo on instagram. 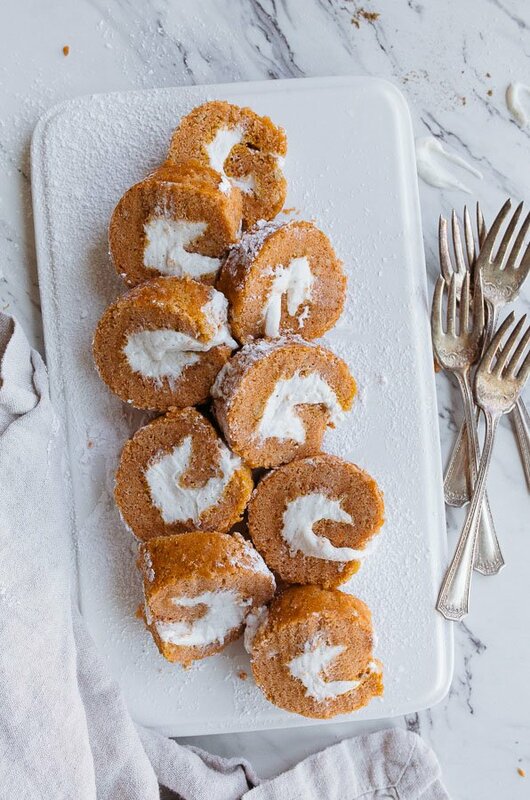 Small pumpkin cake roll for two. Preheat the oven to 350. For this recipe, I recommend a metal or ceramic 8x8" square pan that has sharp corners, not rounded corners. Trace the bottom of your 8x8 pan on a piece of parchment paper, and then cut out the square. The parchment should fit exactly in the bottom of the pan without any overhang whatsoever. (Any bumps or gaps in the paper will allow batter underneath and ruin your cake!) Place the parchment in the bottom of the pan. Do NOT grease the pan. In a smal bowl, sift the flour, baking powder, cornstarch, and pumpkin spice together. Sift it into another bowl, and then finally sift back into the first bowl for a total of 3 sifts. Be careful not to lose any flour in the process. Next, melt the butter and milk in a small dish in the microwave at full power for 15 seconds. Leave it in the microwave--you'll reheat it one more time. Finally, in a medium sized bowl, combine the sugar and eggs. Beat with an electric mixer on HIGH speed until it has the consistency of fluffy whipped cream. It will be pale yellow, frothy, and when you lift the beaters, the batter will draw a line and then sink into the rest of the batter. This will take 5-10 minutes with new high-speed mixers; longer with older models of mixers. Add one-third of the flour mixture to the egg mixture and gently and SLOWLY fold in with a rubber spatula. Proper folding technique is down the middle and around the edges gently. Add the rest of the flour in two batches, gently folding each time. Reheat the milk and butter in the microwave for another 15 seconds. Remove it from the microwave, stir in the pumpkin, and then pour it into the batter. Fold it to incorporate. Pour the mixture carefully into the prepared pan and bake for 19-21 minutes, or until a toothpick comes out clean. Let the cake cool in the pan on a wire rack for 2 minutes. Run a knife around the edge of the pan, and dump the cake out onto a clean dish towel. Peel back the parchment paper. Now, ROLL! Move quickly and with confidence, rolling the cake up inside the towel. Let the towel roll inside the cake--do not try to keep them separate. 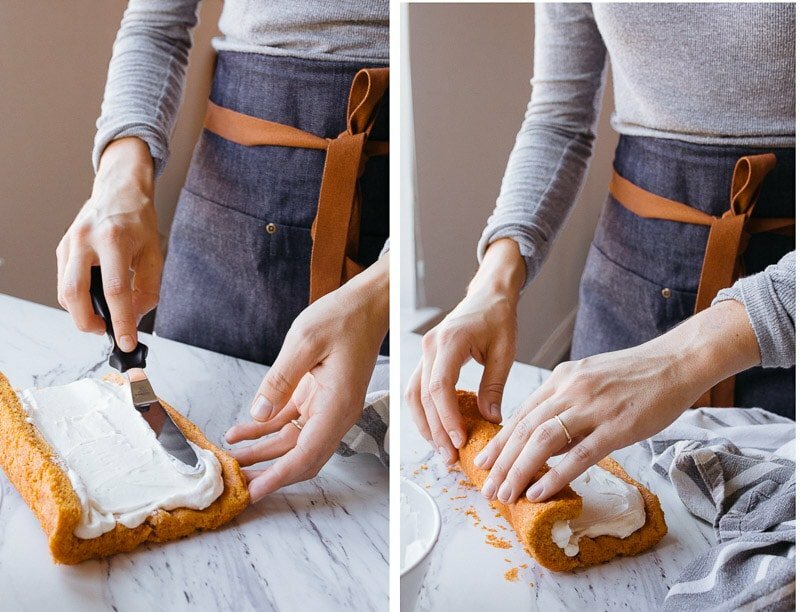 Simply roll everything together, gently twist the ends and leave the cake alone. Do not attempt to unroll the cake and fill it until it is completely cool. Meanwhile, make the whipping cream filing by beating everything together on HIGH with an electric mixer until light and fluffy. Whip until the cream has soft peaks, don't over-beat and make butter. Unroll the cake, spread with the filling, and then roll back up. You can serve it right away, or wrap it in plastic wrap and store in the fridge until ready to serve. Slice into 8 pieces and divide between plates and serve. My Mom & Grandma always sifted some powdered sugar onto the towel first, before putting the cake onto it & rolling. This really kept the cake from sticking to the towel as it cooled and was unrolled. Thx for all you do in the interest of smaller, controlled portions! Also, after reading about a 2-decade study at the Univ of ILL, where butternut squash was used instead of pumpkin, our family has used it exclusively for 20+ years. Butternut tastes the same in recipes but has a much finer texture than pumpkin. Baked in the oven creates a browned side where it touches the pan. The flavor can be off-putting in baked desserts. Cook it in the microwave (cut into rounds and covered w/plastic wrap) remove the skin, then puree when cooled. Freeze it in 15 oz portions, (or other amounts, i.e., the 3T required here) the same as a single can of pumpkin which most recipes require. Oh yum!!! Totally making this when I get home from work tonight…on second thought, maybe I’ll call in sick so I can make this now. 😂 I’ll just tell my boss I have “Bake-itis” 😂 Thanks for another awesome recipe to try!! This was so incredibly yummy!!! My family and I enjoyed it!!! It came together rather easily, as well!!! Have you tried making this without the butter? Seems that as the butter cools it solidifies that creates stiffness in the resulting cake. Without the butter it remains more flexible and the gluten strands in the flour are not “shortened”. I haven’t tried this recipe yet but other rolled cake creations generally try to minimize the solid fats. Several people have mentioned this, but I haven’t tried it! I like the flavor, softness and richness that butter brings to a cake, so I don’t know how I would feel if it were omitted. If I wanted to make the original large size, should I just double the recipe?! No, that won’t work, sorry. I would find a different recipe if you want a big pumpkin roll. I find that when i open a carton of ‘large’ eggs. The sizes could range from 2.2 to 2.3, and even found a 2.4oz egg in there! . So I’ve been weighing my eggs in order to achieve the same result each time with a recipe. Do you ever do that? If so, what would you consider a “large” size egg? Hi there! Finally I found a swiss roll recipe that can be made in a brownie pan. It is not easy to find a standard size jelly roll pan where I reside. Can I tweak this recipe to a basic vanilla one by removing the pumpkin puree? Perhaps add a little more liquid? Please help. Thank you so much for sharing.